The annual student exchange between Forest Grove and its sister city concludes Wednesday morning, Oct. 31. Students from Forest Grove's sister city Nyuzen, Japan left for their next adventure this morning after spending the last five days in Forest Grove on the annual student exchange visit. Participating in all things Forest Grove during the week, the student delegation was welcomed and celebrated over dinner Monday evening, Oct. 29, in the community auditorium. 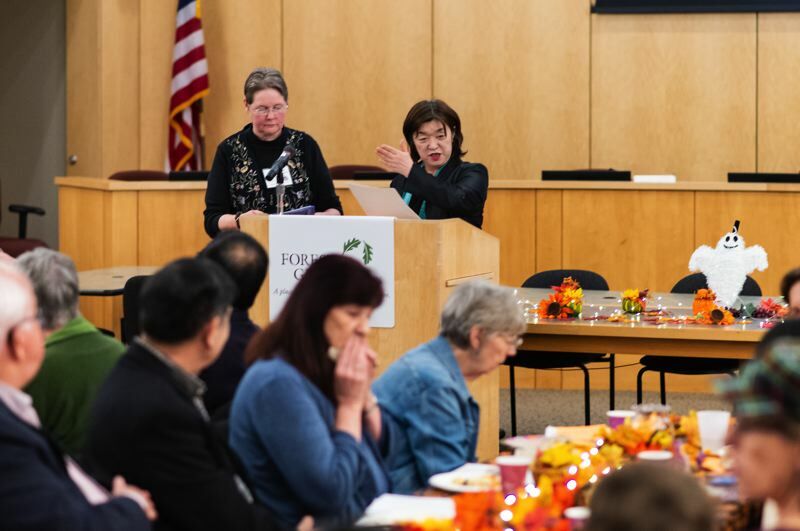 "This relationship is not only one of the community of Forest Grove with the community of Nyuzen, but people," said Forest Grove Mayor Pete Truax during Monday's welcome dinner. "It's not just city to city, it's people to people. … and that's the bonus of this kind of relationship." Nyuzen, a port town on the Japanese island of Honshu, is Forest Grove's only sister city. The communities have been twinned since the late 1980s, celebrating the 30th anniversary of their sister city relationship this summer when a delegation from Nyuzen visited Forest Grove. As part of the sister city relationship, the Forest Grove School District and Nyuzen schools have a student exchange every year. Arriving Saturday morning, Oct. 27, the 10 students and three adults stayed with host families in Forest Grove during their stay. "To the students, I want to specifically say that we are glad you are here," Truax said. "We are glad that you have felt it important enough to visit Forest Grove. ... And please remember, the doors to our community and our hearts are always open." On Monday, Oct. 29, the student delegation visited Pacific University and observed classrooms at Neil Armstrong Middle School and Forest Grove High School, eating lunch in the cafeteria with other students. "When I think about what we are trying to do for our students, we've got lots of assessments, and we are learning lots in language arts, but these kinds of relationships where they get to see other cultures and work with other kids who think differently maybe, have different experiences, building empathy, that's what's really important for our students right now," said Forest Grove School District Superintendent Dave Parker Monday evening, "building citizens who can understand what's going on in the world, so for me this is really exciting." 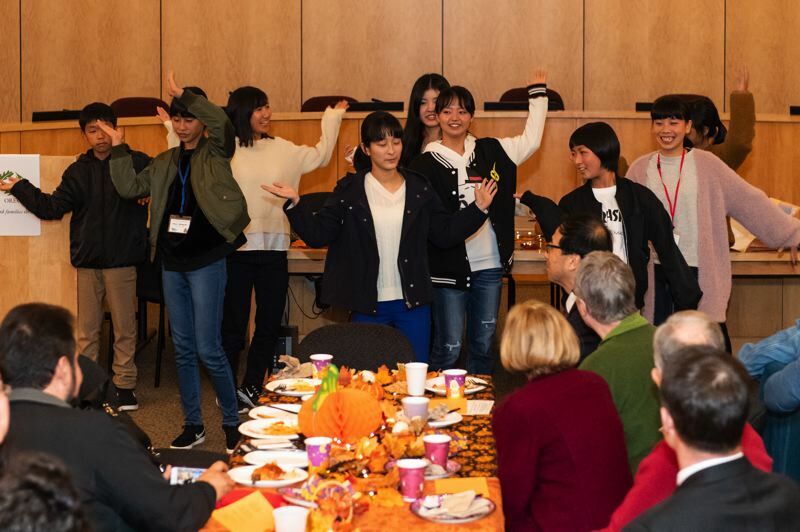 Exchange student Miyu Funamoto said getting to meet and communicate with kids her age at the high school was the best part as of Monday, translated through community and Sister Cities Committee member Azumi Stapp. "I participated in the exchange program (when I was a student) and now I'm on this side and being able to help," said Stapp who is also from Japan and assists the delegations in translation on their visits. "It's good to see two parts come together once in a while." The students also visited the Forest Grove City Library and toured both the Forest Grove police and fire stations Monday. 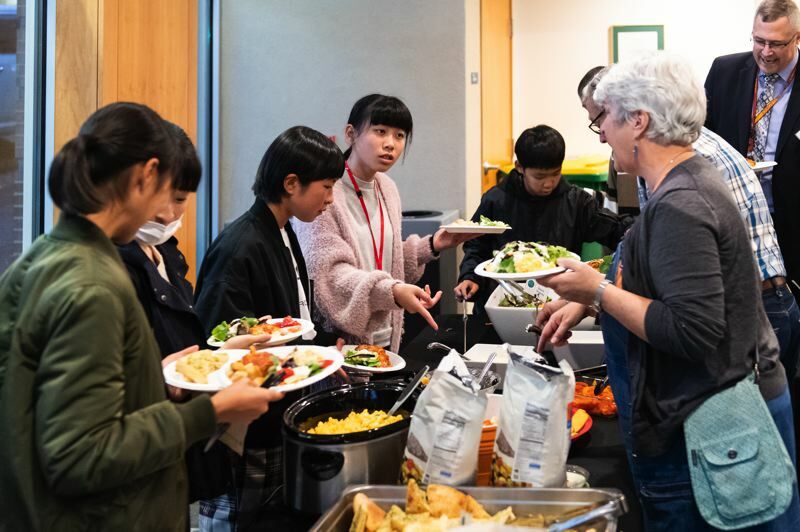 In the evening, students and their host families attended the dinner and welcome reception led by Mayor Pete Truax, with several city council members, city manager Jesse VanderZanden, Portland Consul General of Japan Takashi Teraoka, and other community members in attendance. Gifts and words of gratitude were exchanged and the student delegation performed a song and dance for those in attendance. Tuesday, Oct. 30, was spent participating in fun activities across town including a visit to Plumper Pumpkin Patch & Tree Farm LLC in Hillsboro and a tour of Fernhill Wetlands and Roger's Park. The students got to join Pacific University students in pumpkin carving and other halloween festivities Tuesday evening before leaving town Wednesday morning, Oct. 31. A jam packed five days for the student delegation, keeping this annual traditional alive is important to both cities, Truax said. "For over 30 years, the people of Nyuzen and the people of Forest Grove have worked hard to build a contract of cooperation, communication and care across 16 time zones," he said. "That is no easy feat and it takes work, attention to detail and a desire to build international understanding. And it has worked. And you are the latest in a long line of people to forge that bond. For that, I am grateful."